INDIAN RIVER, MI — While enjoying breakfast at a north woods restaurant just after dawn, Phil Croff noticed some men in the parking lot ogling his boat. They got out of their truck and made a bee-line to his wooden drift boat and trailer. 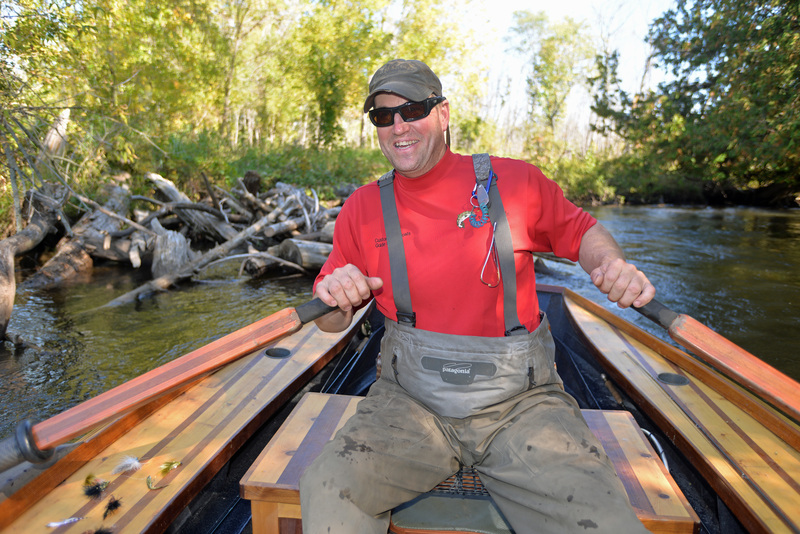 For Croff, a 45-year-old drift boat builder and fishing guide from Alanson, it was a fine way to start the day, almost as good as what would follow, fishing one of his favorite tip-of-the-mitt streams, the shallow and swift waters his boats were designed to float. Standing 6-foot-1, with a friendly, engaging personality, Croff found his bliss building boats and guiding anglers. He turned to boat building after more than two decades in the construction trade as a carpenter. His first boat was an experiment to find a way to safely fish for big brown trout at night. Croff began by searching online for an appropriate design. The boats he found weren’t stable enough, so he began to sketch his own design and told his wife he planned to build a boat. And that’s what Croff did. The boat he made was wide and stable, with a low freeboard for easy entry and river access. He built it from Michigan cedar and walnut, materials he still prefers because of their outdoorsy appearance and weather-worthiness. He constructs oars from Douglas fir and cedar. “If you saw where I put these boats and what I run them through, you would be shocked, but they are pretty rugged,” said Croff, who spends approximately 100 days or nights a year guiding, and many more searching for perfect, fishy holes. 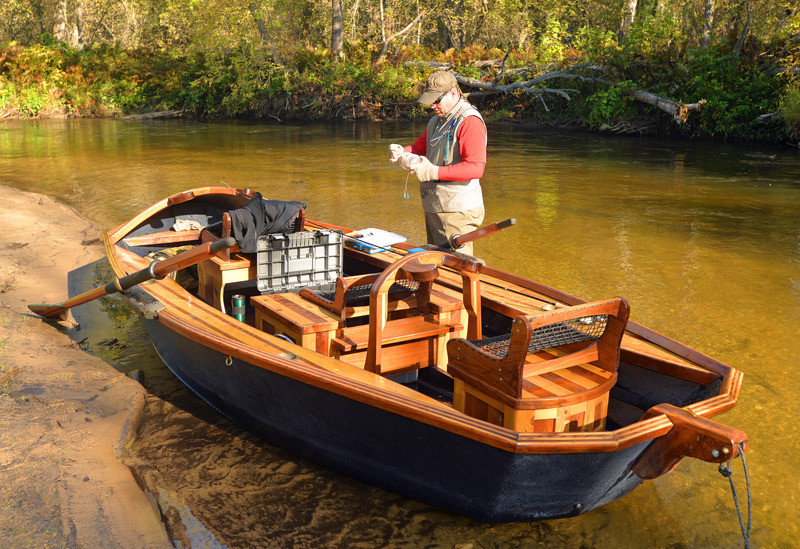 Friends and others saw Croff’s first boat and admired its beauty and his craftsmanship. He began to get orders and, in time, opted to change careers. Croff-Craft Custom Driftboats was launched in 2006, along with his CC Guide Service. Each of Croff’s boats is custom-built. Clients can choose from two- or three-seat versions and a variety of storage compartments. His boats run from 14 feet to 16 feet long. Each takes about 350 hours to build, and they sell for about $14,000 with trailer. 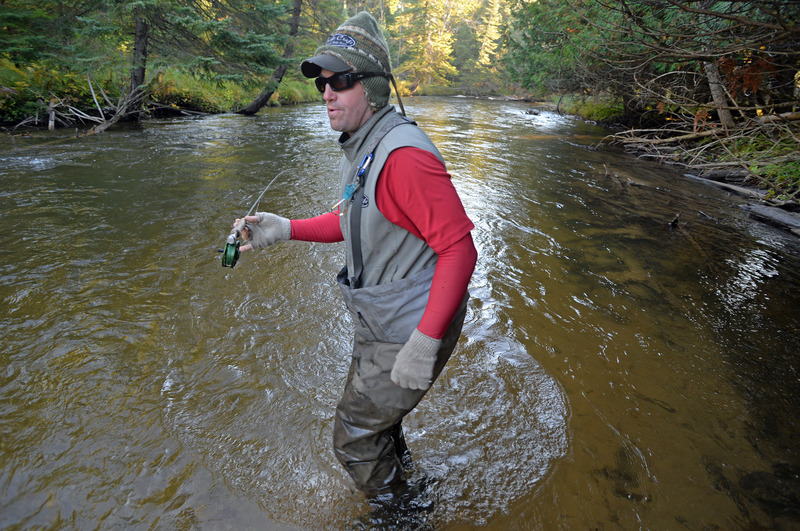 Croff also builds a 12-foot Orvis model that is featured exclusively by the Vermont-based fly fishing giant on its website. “His boats are stunning to look at,” said Robert Thompson, a fly fishing filmmaker and owner of Third-Year Fly Fisher, his Chicago-based video production company. Thompson recently shot segments with Croff for an upcoming video about the lives of musicians who record by day along a northern Michigan river and fish it at night. Croff’s wife, an artist herself, said her husband’s career change was good for him. The transition had its challenges, but he continued to take carpentry work until his boat company and guiding business could float themselves. “He’s always loved working with his hands, doing all kinds of construction and carpentry work. But he always seemed unsettled, “she said. “When he hit on this, I saw a passion I had not seen him find in anything else. This entry was posted in Uncategorized and tagged Alanson, Artisans, Boat building, Boats, Croff Craft Custom Driftboats, Driftboats, Fishing, Fly Fishing, Phil Croff, Trout, Woodcraft. Bookmark the permalink.